In the digital world, protection against information theft by unauthorized entities is the most demanding services for enterprise business organizations. Although firewalls and intrusion detection systems are able to prevent outsider attacks (i.e. attacks attempted by individuals outside the organization), still insider attackers are the most serious threat. Enterprise Digital Rights Management (E-DRM) are strategies and schemes to protect sensitive information by managing and enforcing access and usage rights to the information throughout its life-cycle, no matter where the information is distributed. Among the recently proposed cryptographic solutions to E-DRM, we noticed several efficiency drawbacks and security weaknesses. 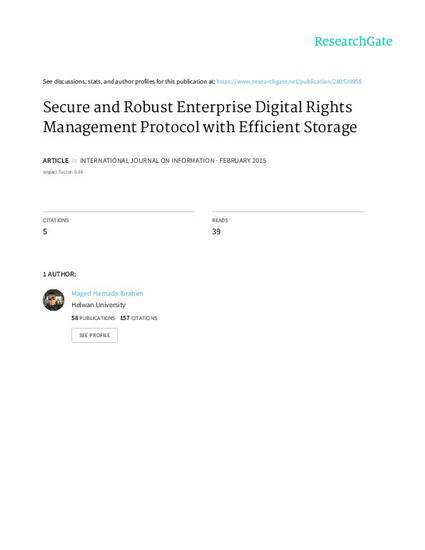 In this paper we device a stronger digital rights management protocol for enterprise applications that overcomes the security problems and efficiency drawbacks in previous protocols. Our proposed protocol satisfies the requirements for an E-DRM protocol, provides more efficient and robust storage of large digital packages/files and provides stronger security against corruptive adversaries.  Our proposed protocol ensures privacy against the authorization authority and the unauthorized users while reduces the computations and communications burden of the author, the authorization authority as well as the users.